A friendly family run hotel combining a relaxed atmosphere with excellent service. The hotel occupies one of Blackpool's finest positions overlooking Gynn Gardens, Queens Promenade and the Irish Sea. 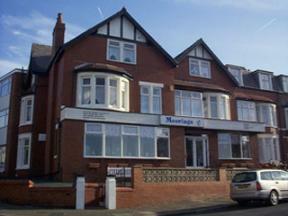 The Sandalwood is a small family run guesthouse in the north shore of Blackpool. Most rooms en-suite. Licensed bar. AA 3 star accredited. We welcome couples, families, business people, contractors, small groups, conference delegates. A warm, friendly welcome awaits you at The Merginn, a clean and cosy family-run hotel. In the quieter North Shore area of Blackpool, it is an ideal location for a quiet and relaxing break. Brian and Doreen warmly welcome you to the Bromley Hotel. Our aim is to provide a clean and friendly family run hotel. Blackpool has a broad spectrum to suit all ages and tastes. Free parking. The Edward Hotel is a warm, friendly popular hotel with famillies and couples mainly, a great central location in Blackpool. It is close to all the attractions this famous seaside resort has to offer.